Christopher Nolan's gritty Dark Knight joins NECA's line of 1:4 scale figures. Based on Christian Bale's version of the Caped Crusader, this Batman stands over 18-inches tall and features a soft fabric cape and movie-accurate details. He even includes the hidden compartment in his boot heel that stores a sonar signaling device! 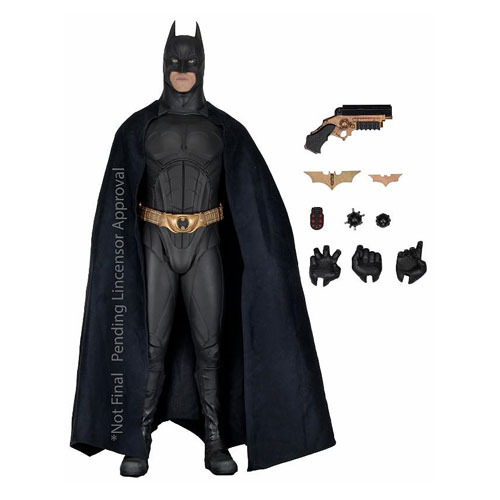 The Batman Begins 1:4 Scale Action Figure is loaded with accessories, including grapnel gun, large hinged Batarang, small Batarang, open and closed mines, sonar communicator, and two pairs of hands. This is a must-have for fans of director Christopher Nolan's Dark Knight trilogy! Ages 14 and up.